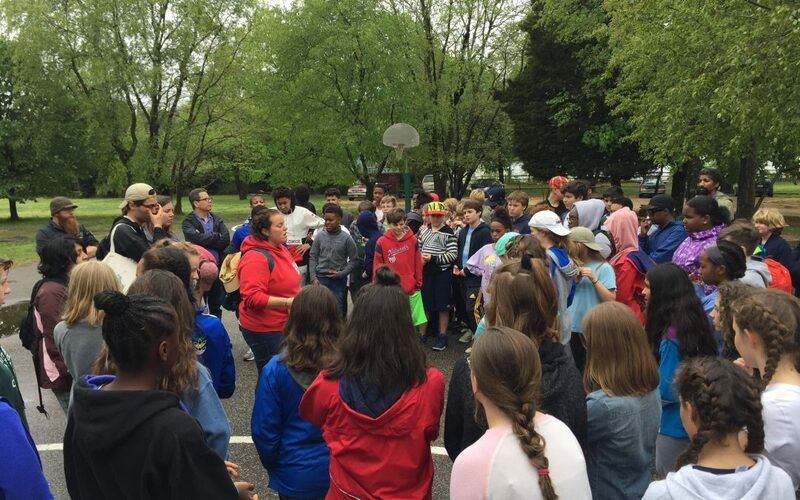 This week the seventh graders took their annual trip to Echo Hill Outdoor School in Kent County, MD. Students engaged in various daily classes including Survival, Aqualogy, Adventure (low-ropes course), Bay Studies (in a boat on the Chesapeake) and Scanoeing (swamp canoeing). Students stayed in platform tents, ate in “The Whip,” and experienced the excitement of night hikes. The overnight trip allows students to get to know their peers and teachers and become more aware of the natural world around them, and also connects with some of their study of life sciences this year. Outdoor education is also a key part of the high school curriculum, with trips into nature for fifth, seventh, ninth, eleventh, and twelfth graders occurring each year to teach orienteering, team work, and ecological understanding.